Hope Studios: Why Don't You...Store Your Christmas Lights? Why Don't You...Store Your Christmas Lights? It's almost time to take down the tree, I'm counting the days until January 1st when my tree comes down. I want my house back! 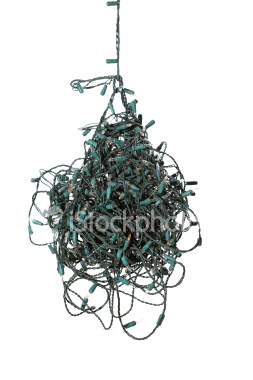 Here are a few tips I've collected so you can avoid the dreaded ball 'o lights next year. 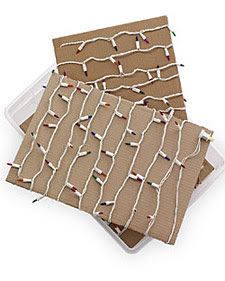 Martha suggests storing lights on pieces of cardboard with slits cut into the top and bottom to secure the cord. Several sources recommended winding them around the empty wrapping paper tubes. Or you could just loop them around your hand, then, plug the ends into each other and hope for the best, like I do! Thanks for this! That'll save me some time next year. Your tutorial Tuesday ended early this week, is there a limited number of spaces available? I love doing this. It works great. My tree and Christmas decor are all down and packed away already. Couldn't take it till the end of the year. Of course our tree came down YESTERDAY. LOL Great ideas though. I don't know if you know Edie or not,but i have a prayer-hop for her on my main blog: http://www.theshadesofpink.com/2010/12/shes-like-my-favorite-blogger.html if you would like to add your prayers. This will be our first year to face this issue, so I'm glad I came to your blog before taking on the notorious task of storing the lights. Thanks for the tips! I have several extension cord holders that I use to wrap my lights around. Works great and saves lots of time next year.